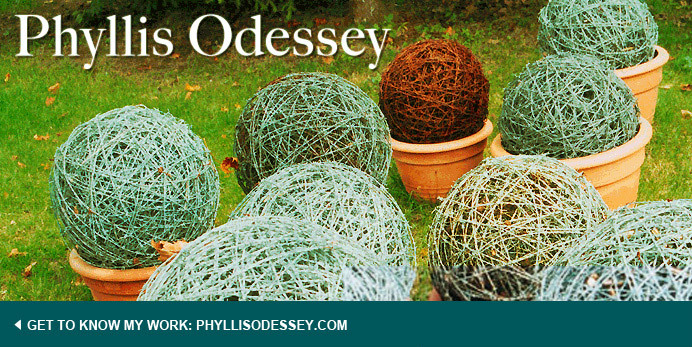 Phyllis Odessey: Talk to Me And apparently you can! Someone recently told me that nothing that happens digitally would surprise them. This might be true, but the Talk to Me exhibition at MoMA will definitely blow your mind. You have to go back a couple of times to take it all in. I decided to focus on the pieces that focus on nature - as we don't know it! BOTANICALLS (photograpah above) it might look like a guitar, but no. "Botanicalls gives voice to our voiceless everyday companions: house plants. Mositure sensors in a plant's soil trigger messages that are sent to a human caretaker over a wireless network. The messages are broacdcast via Twitter or read aloud by a recorded human voice over the telephone: the plants are polite enough to send both distress calls and notes of thanks. At the MoMA show the headphones are below this photograph. You put them on and listen to the tree. "Hello World! is a giant Semacode mowed into a wheat field near limenau, in Germany's Thuringia region. The code is formed by a pattern of light (cut wheat plants mixed with dirt) and dark (mature wheat plants) squares, eighteen across and eighteen down, that when decoded reads "Hello World!" in keeping iwth the tradition of christening any new coding experiment by programming it to produce this cheerful declaration. As part of the exhibition there is a pyramid, like the food pyramid. At the top of the pyramid DARK NIGHT, DIGITAL PAIN. Next in line = IPhone and Mobile Phone call. I recently experienced (briefly) digitally pain. I now understand, how addiction, can sneak up on you and withdrawal is painful at first. Then you realize the sun is still shining, it's a good day for a walk!